Provide, promote and facilitate education and training to help individuals to reach their potential. Provide high quality, affordable day care and after schools services to local children. To provide or facilitate arts and culture activities that will empower people of all ages in North Belfast. Provide the opportunity for young people to grow up and develop social and life skills in a safe and secure environment. The North Belfast Social Enterprise Hub (NBSEH) is a project which aims to assist individuals in developing and starting up their own social enterprises. Provides health and well-being services that reduce stress and encourage development of positive, healthy and resilient lives. Whats new in the Ashton Centre. Find out about new courses or events happening in your area. 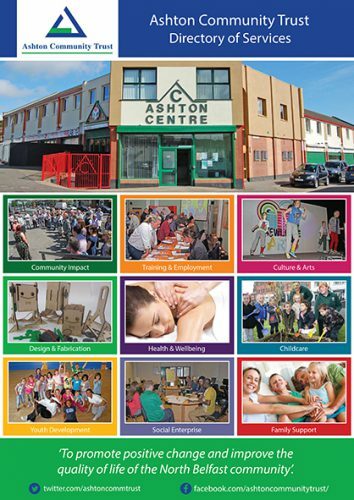 Ashton Community Trust (ACT) is a social enterprise and development trust which seeks to make North Belfast a better place for its residents to live and prosper. It does this through the provision of services, employment, training and community development. ACT has grown over the last twenty years to the extent where it now employs over 250 people and has an annual turnover in excess of £7m. ACT is registered as a charity with the Inland Revenue and is a company limited by guarantee. The company was established by local residents and is controlled by a voluntary Board who ensure that it stays true to its mission and vision. The Board employs staff to manage the company on a day to day basis. Profits are not distributed but are ploughed back into further ACT’s regeneration objectives.